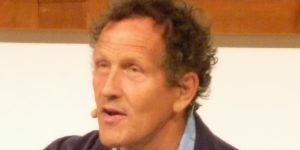 Photo: Monty Don on stage at Gardeners’ World Live 2018. English spoken episodes are published on an irregular basis. Please check current broadcasting schedule, Podbean or Twitter for details. Easy access to latest episodes? Use your podcast app. No charge. Where to find us? Please read our info on Discutafel podcast subscription. Short introduction on permaculture. Who developed this mindset and why? What are main differences with organic agriculture? Ivonne mentions a movie about restoration of the landscape you might be interested in: The greening of the desert by Geoff Lawton (37:07). The commentary is in Dutch, but we hope you’ll enjoy the specials anyway!